When I saw the HK-537 for sale, I made an immediate request to hold it for me with a cashiers check on its way. 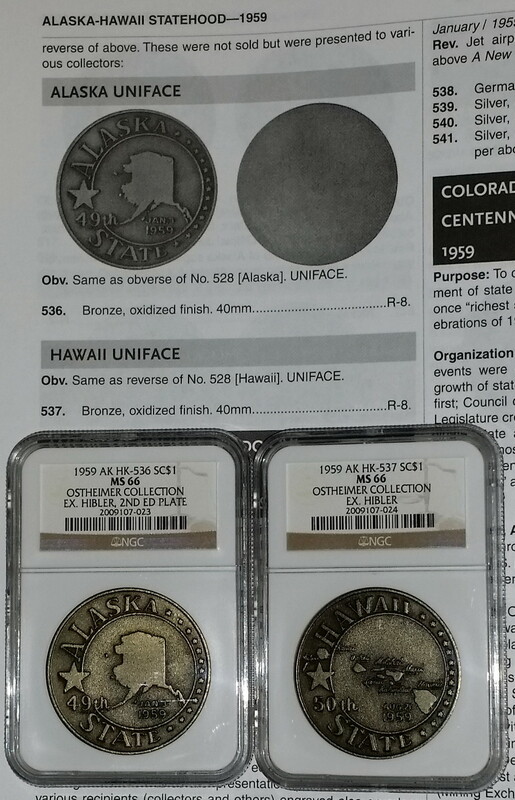 In the return email communication, I was offered the HK-536 as an add on-sale in order to keep the Hawaii and Alaska Uniface medals as a matched pair. I’m glad that I made the additional purchase. There were only 11 pairs of Alaska-Hawaii Uniface medals that Clifford Mishler struck. Mr. Mishler is the current American Numismatic Association (ANA) President. This is the only known matched pair (obverse and reverse) that has been graded/encapsulated by the Numismatic Guaranty Corporation (NGC). I recently received my Hibler-Kappen So Called Dollar 2nd Edition book. The Alaska HK-536 is the plate coin (plate coins are superb examples of the type) and attributed with an Ostheimer Collection and Hibler pedigree. The Hawaii HK-537 is attributed with an Ostheimer Collection and Hibler pedigree. The Hibler-Kappen 2nd Edition book did not have a HK-537 plate coin (no image in the book). This is the only known image of the NGC encapsulated HK-536 with its original plate coin image from the Hibler-Kappen So Called Dollar 2nd Edition book.